Just about the most charming and picturesque region you could travel to in Italy, the colourful cliffside towns that make up Cinque Terre are a dream destination. In my previous post from the area, I outlined where we stayed and a few other noteworthy bits. This post will focus solely on the 5 towns in the Italian Riviera which are (from N to S): Monterosso, Vernazza, Corniglia, Manarola, and Riomaggiore. Aside from the obvious beauty of the towns, one of the major reasons they have become so adored is due to the seaside hike that takes you from one town to the next. Due to the earthquakes in 2012, some of the hikes are still undergoing remediation and are closed to the public. As of currently, the closed trails are between Riomaggiore & Manarola, and Manarola & Corniglia. Unfortunately, those are said to be the least challenging of the trails. Clearly for me an easy jaunt > a strenuous hike. The only one I personally did was one of the most challenging, between Levanto (NOT one of the 5 towns) and Monterosso. Honestly it was a pretty tough hike, but luckily you are shaded for most of it, and Monterosso waits at the other end! For those who want to avoid hiking altogether (like I did every other day), the train system is easy, reliable, and fast. Make sure to stamp your day passes though because they are always patrolling the train cars! And word to the wise: do not use the boat system! It sounds great in theory but we decided against it. When we were in some of the towns we saw the insane lines of people waiting for the boats… it looked like mayhem and far too crowded to be enjoyable. The region is known for white wines, limoncello, seafood, focaccia, and pesto. And probably some things other than food & alcohol, but who cares about those? To be honest, I find the food in southern Italy just incredible and way more to my own personal liking, but who can hate on pesto and focaccia? Though after a week it did get a bit tiresome, and almost all restaurants have a slight variation on the same menu, but you will definitely enjoy it while you are there! See below for restaurant recommendations by town, as well as any other town-specific info I picked up on while there! Monterosso: The largest of the 5 towns, situated right on the seaside, with a small but very recognizable beach covered in orange and green striped umbrellas. This town is possibly one of the busiest, although they ALL get very busy which is a shame. We came here most often, as it was the closest to where we were staying in Levanto. It is not worth it (in my opinion) to try to lay out on the beach here. It is all paid spots and they fill up so early in the morning. It is also super overpriced (in Levanto we paid half of what we would have paid in Monterosso for a beach chair). Two restaurants that were fantastic were Torre de Aurora (just opened this summer, in a castle on a cliff top with different patio levels all the way down) and Miky (a Michelin starred restaurant that was incredible). Vernazza: Did not have the best luck in Vernazza! I wanted to do a partial hike from Vernazza to Riomaggiore, as supposedly the best view of the town is about 30 minutes into the trail, but it was ridiculously hot that day and we got too frustrated trying to find the start to the trail. 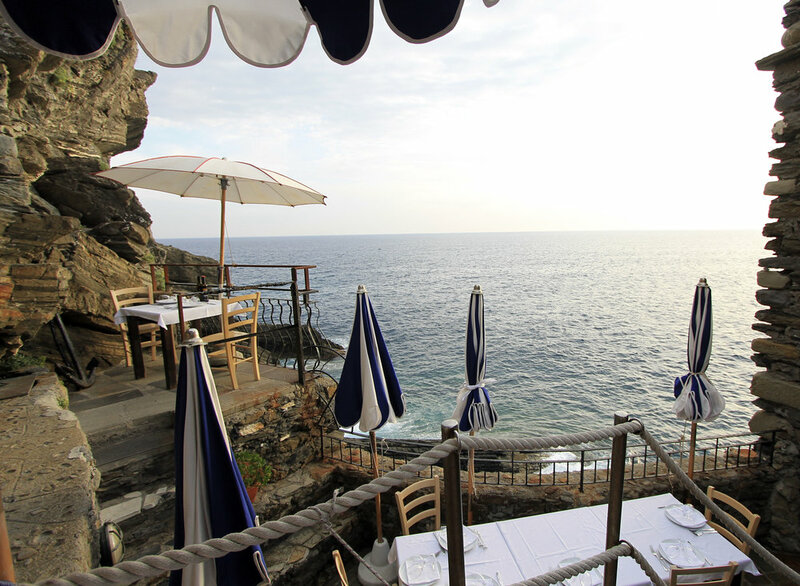 We were also dying to eat at Ristorante Belforte (in my photos, it’s the place with the blue stripey umbrellas. SO DREAMY.) but we learned that most people make reservations months in advance so we were SOL! We ended up having dinner at a cute spot called Gianni Franzi that overlooks the main beach. Corniglia: The only town I did go to. Corniglia is the only town of the 5 that is not on the sea. It is high up on a clifftop and has incredible views. My family ended up doing the hike between Corniglia and Vernazza and their photos were pretty incredible. Manarola: Painfully perfect. Like, I look at the photos I took from the lookout point in Manarola (facing back towards the town) and feel physical pain at how pretty it is. It looks like a painting! Colourful buildings spilling down the cliff to the rocky sea where people swim. It is heaven. Two restaurants that you can’t miss are Trattoria del Billy (great views if you can get a spot out on the patio, amazing food) and Nessun Dorma (the best view you could ask for of Manarola… the entire restaurant is on a patio covered in tropical flowers and plants, and the food is so delicious and fresh. After eating pesto and focaccia for days on end, we were able to get amazing salads and bruschettas here, along with ridiculously good drinks). Riomaggiore: Started our day here one day and did lots of wandering. So many pretty look out spots! Did not do much in Riomaggiore other than walk around, but it’s just as pretty as the rest of the towns, and I love the photo of the little harbor with the bright buildings snuggled up around it.